You must be frustrated with constant ankle pain. An Achilles tendinitis injury is no fun! You want to quickly get back into your exercise program and life without this debilitating soft tissue injury. Continue reading below and discover the answer for your chronic Achilles tendon problem! Short Achilles Tendon? – Kick The Heavy Boot! Many of my clients had been placed in an ankle boot and visited me for treatment because this therapy did not repair their damaged Achilles. In fact continuous heel bracing may reinforce the overly shortened soft tissue and scar tissue formation. My clients were very eager to kick the boot and resolve their Achilles ankle injury and they have! Finding the correct treatment for your ankle pain has become a top priority. Creating correct soft tissue balance above, around and within the Achilles tendon and where this tendon inserts into the bone is very important. Removing the scar tissue associated with Achilles tendon injury is also required for healing. This balance is often neglected resulting in chronic inflammation. 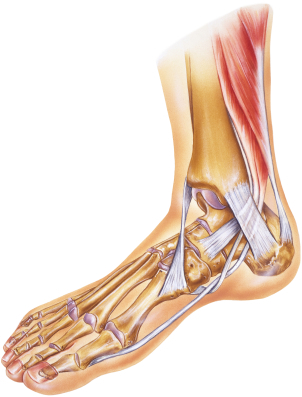 In order to correct the inflammation I lengthen all of the muscles, ligaments and surrounding connective tissue (fascia) located above and around your heel bone (the calcaneous). I treat the Achilles tendon at its insertion. Within our life we shorten the soleus, plantaris, gastrocnemius muscles, Achilles tendon and surrounding fascial tissue. This happens with repetitive motion, sports, shoe choices and at times health conditions which do not allow our soft tissue to heal promptly. My therapeutic massage involves very specific and focused work to assist with your quick recovery. While lengthening your calf muscles, Achilles tendon and all of the connective tissue around the heel, I am also gently breaking up any existing scar tissue formed from repeated microtrauma. This is important because scar tissue impedes blood flow and flexibility. Tendons are also known to have less blood supply and require the correct soft tissue treatment to stimulate circulation for prompt recovery. If left to heal on it’s own your Achilles tendinitis can become a chronic or acute condition. A tight Achilles tendon and calf may also be part of the problem leading to Plantar Fasciitis. I help you recover from both in record time. I am Michelle Hamel LMT-NMT, a Certified Neuromuscular and Myofascial pain relief specialist. Your treatments may include infrared light therapy and therapeutic essential oils which assist with lowering inflammation and healthy cell regeneration.